The tea ceremony (Cha no yu, 茶の湯) is a ritual of Japanese culture related to Buddhism and in particular to the Zen philosophy. Tea consumption by the monks has ancient origins, in fact, because of its exciting properties, it was often used during long hours of meditation to increase concentration and fight drowsiness. The origin of a generic formal ritual to accompany the consumption of tea certainly has Chinese origins, but the tea ceremony we know today was developed entirely in Japan over the centuries and has a very ancient origin, in fact, in the sixteenth century, the monk Sen No Rikyu "codified" the rite, creating a tea ceremony style called Wabi-cha. 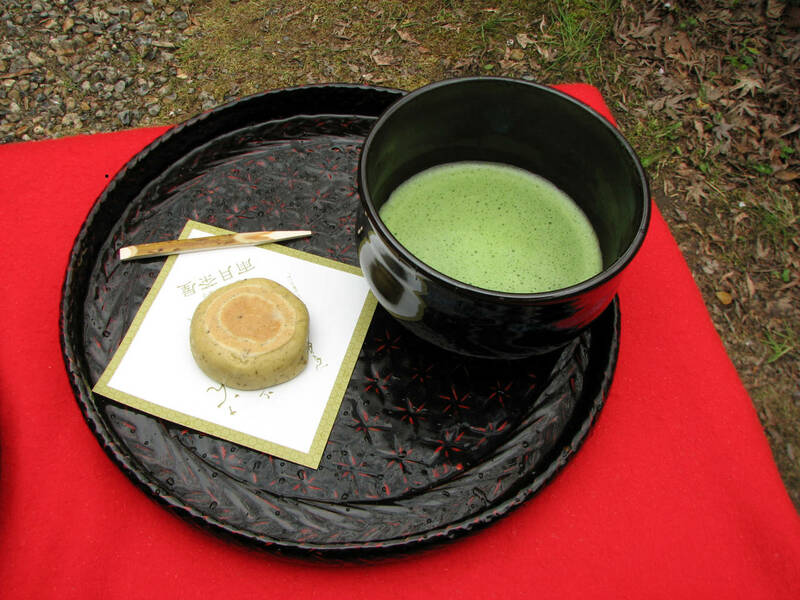 That which differentiates the Japanese tea ceremony from any other ritual linked to the consumption of tea in the world, is that in the Japanese vision, the purpose of the rite is not preparing and drinking tea, but they are only a way to achieve a harmony with nature and inner peace in order to foster meditation, as taught by the Zen tradition. 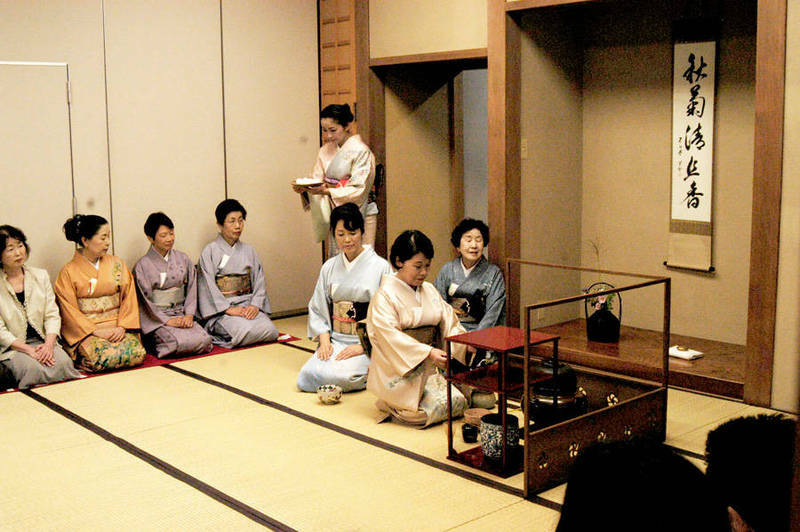 Today, there are many schools of tea ceremony in Japan, each with its own style (the most important founded by close descendants of Sen No Rikyu are the Ura Senke, Omote Senke, and Mushanokoji Senke), but they all follow same basic principles and some procedures. The tearooms (chashitsu) are usually quite small (the standard size is four and a half tatami) and without any decor. The room should be in fact more empty as possible, as should be the minds of the guests during the ceremony, empty of any trivial and mundane thought. The only decorative element is usually a typical alcove (tokonoma) inside which there is a work of calligraphy (shodo) and/or a flower arrangement (ikebana) adapted to the occasion and the current season (and it is called chabana, which means "flowers for the tea"). 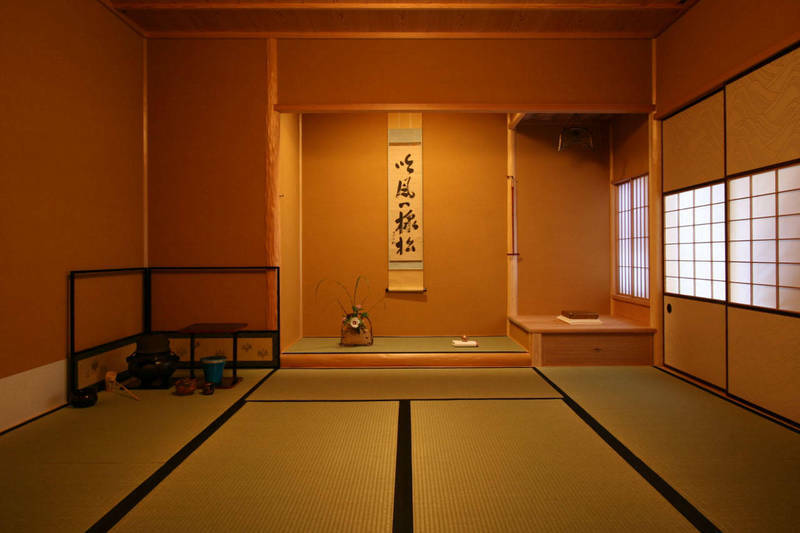 After the entry of the guests in the tea room, by order of importance, the one who will prepare the tea (the teishu) appears behind a sliding door, knelt down in seiza position. Now, the teishu starts to place the various tools and to prepare the tea into the cups, called chawan, and every guest is invited to eat a sweet, which usually accompanies each ceremony. After that, the teishu serves the cups to the guests, and they drink the tea each one at a time, with short sips, expressing their satisfaction. Every guest, before starting to drink his cup, asks for permission to the adjacent guest, saying the word "osakini". Once finished drinking, each guest cleans the edge of the cup and put it in front of him, then it is taken by the teishu, who will wash all the cups. When everyone has finished drinking the tea, the most important guest asks permission to examine the tools used, then all the tools are observed by all the guests. Lastly is observed the cup. The ceremony ends with the teishu who returns to the initial position, bows to the guests, and closes the sliding door. This was obviously a simple ritual of a tea ceremony, but, as I said, there are so many styles each one with its rules. If you are planning a trip to Japan, there you will have many opportunities to watch live or to participate in an authentic tea ceremony.